The above painting I did after our evening spent at a Flamenco show in Cordoba. We had spent the day exploring this historical city followed by a wonderful meal and then this fabulous show. I am so glad our hosts, Mike and Hilary knew where to take us for the best food and entertainment. The Mosque was built beginning in 785 during the Moorish occupation. A cathedral was built inside the mosque in 1523 when the Christians took over the city. 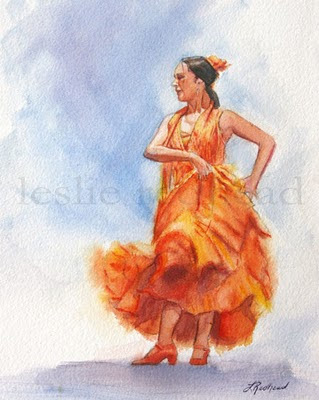 Flamenco. We were fortunate to see the Spanish Men's National Champion perform. 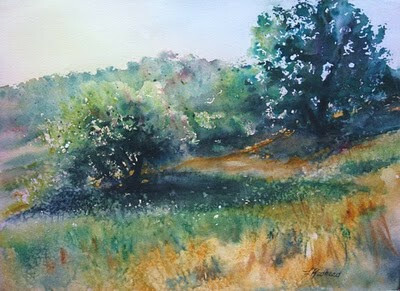 The Olive Grove, watercolor, 11x14"
My friend and student Sam Boehner and I decided to take a walk up the hill behind El Molino one morning. It was covered in Olive trees. Our goal was an abandoned house which made for some great photos. Following our excursion, I demonstrated the above painting of olive trees. Painting the quince tree and chair. Hail Noble Fruit!, watercolor, 11x14"
I was told it never rains in the south of Spain in June. 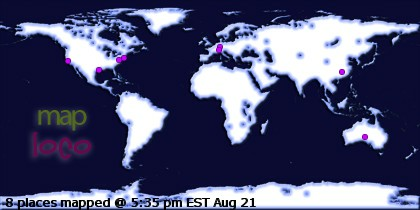 However, weather patterns have changed everywhere. It did rain in June and the grapes plumped up quite a bit while we were there. Even though we painted outside, we were sheltered from the rain. Instead of painting in the olive groves, we were able to paint the grapevines hanging all around us. I demonstrated this painting by first pouring paint, then blowing it and doing a bit of finger painting. When it dried, I used the impressions the paint left behind to create grapes and leaves with some negative painting. It is available for purchase through my Etsy shop. Now I need to post some photos from our awesome excursion into the village of Ronda which was first settled by the Celts in the 6th century BC. It is built around a beautiful canyon with a Roman bridge spanning the canyon and connecting the old city with the new. Ernest Hemingway and Orson Welles were both inspired by Ronda and wrote about the city and its unfortunate history (Spanish Civil War) as well as its traditions in bull fighting. Roman Bridge. It was a prison at one time. View of the valley from the bridge. The older village of Ronda. El Molino Palm, poured watercolor, 11x14"
We woke up on the third day of our visit to cloudy skies. It was a bit of a bummer but it did cool the day off enough to enjoy hiking up and down the hills of the village of Iznajar. It also allowed for us to catch up on all those paintings that we started. The above painting is another pour from the front of the resort. Iznajar is a white village above this beautiful lake. Since Andalucia has received an unusual amount of rain this past year, the lake is the highest it has been in over 100 years. At the top of the village is this 11th century church. This is one of the courtyards in the village. It was eye candy to all us artists. I can't wait to paint some of the photos I took of this place. I have spent the last 2 days trying to catch up with everything that happened while I was away and dealing with major jetlag. It is nice to know that the kids, the dog, and the house survived while I was gone. I was missing the sun but it finally made an appearance this morning and it helps to get over the wish-I-were-still-in-Spain blues. The above painting I did the first afternoon I was at El Molino. I was so excited to paint that I skipped siesta so I could capture the view from where I sat during the course. This is the watercolor table where myself and 3 of the participants painted during our stay. This is the back of El Molino with the pool that called to us every afternoon when it got too hot to paint. I arrived home from my fabulous painting workshop in Spain last night. It was an incredible experience. There were 2 instructors- Rick McDiarmid and myself plus 12 participants. The place that we stayed is an old bakery and mill that has been turned into a B&B called El Molino. Mike and Hilary Powell from Flavour of Spain were our hosts. Flavour of Spain specializes in painting and cooking holidays in south of Spain. Mike was our chef and the food was the best I have ever tasted. Gourmet meals every night. We were definitely spoiled. This is the front of El Molino. There were olive groves everywhere. This part of Spain produces a third of the world's olive oil. What was nice about the area is that it is out in the country and is all locals. The scenery was amazing and the people were genuine and friendly. We arrived on Sunday night, June 6, all of us eager to get started. So eager that we woke up early on Monday and wanted to paint. 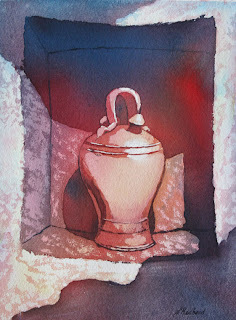 Spanish Jug, poured watercolor, 11x14"
My first lesson was to show how to pour watercolor paint. We all sketched from life this beautiful Andulucian jug then transfered it to the paper. After masking (or saving) the whites, we began pouring our paint. In between pours while we waited for it to dry, everyone sketched out what they wanted to do next. The first 2 days were spent doing a couple of poured paintings. I will show the other one next time I blog. If you want to read more about the trip, check back in a couple of days. I will continue to tell you all about it as the week goes on. The Spanish Jug is for sale. If interested in purchasing, please go to my Etsy shop. 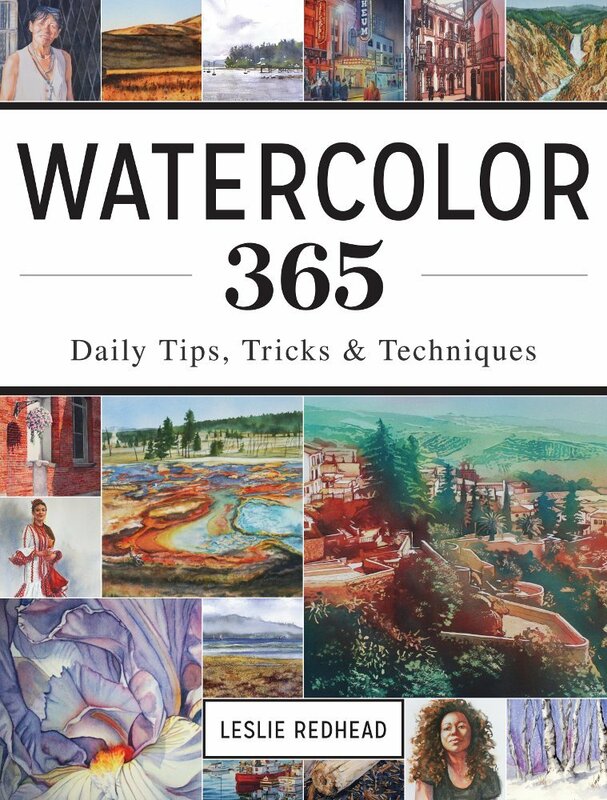 I will be in the south of Spain for the next 2 weeks teaching watercolor. Leaving the family and the house behind. 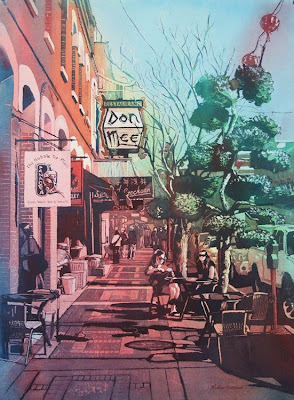 It will be nice to be footloose and fancy free with nothing but the sun, my paints and good company to occupy my time. But I will be back and I will be posting all those sun inspired paintings. 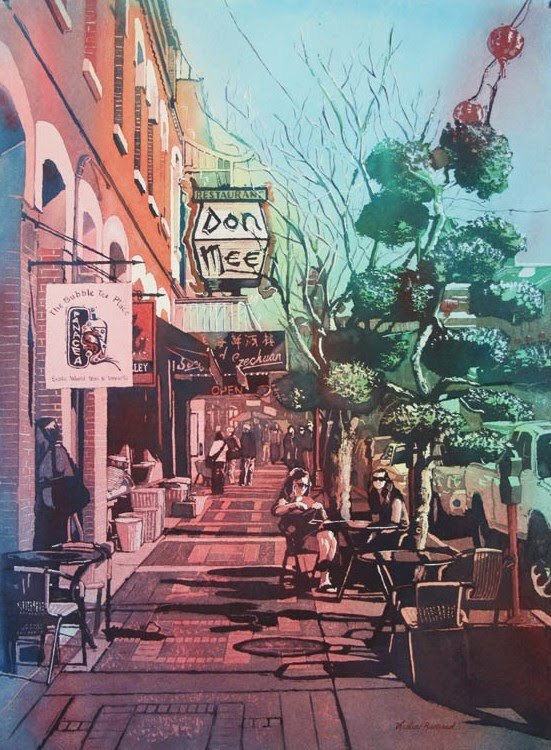 The Hearbeat of Chinatown, poured watercolor, 21x29"
Another painting of Chinatown! This one is off to Madrona Gallery as well. My next pours will be of Spain.